While many know of Ellen Kushner as an award-winning novelist, she is also well-regarded as the host of PRI's Sound & Spirit with Ellen Kushner, a weekly program on national public radio, mixing music and ideas from a variety of disciplines and artists. Ellen paid her dues to publishing with such roles as editor of fantasy fiction (Ace Books/Grosset & Dunlap and Pocket Books/Simon & Schuster), copywriter, literary scout, and author of series books for children. Her first adult novel, Swordspoint: A Melodrama of Manners, was published in 1987. She followed this up with Thomas the Rhymer in 1990, which won both the Mythopoeic and World Fantasy Awards. 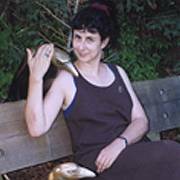 Ellen is also the author of numerous works of short fiction and poetry published in The Year's Best Fantasy and Horror annual collections, the four volumes of the Borderland series, Bending the Landscape, and other anthologies and magazines. She has edited two anthologies of magical fiction, Basilisk and The Horns of Elfland. This phone interview was conducted in late October 2002. Steve Berman: In addition to being an acclaimed writer, you also host Sound & Spirit, a weekly program broadcast nationally on public radio that explores world music, myth, and spirituality. How has your love of music affected your writing? Ellen Kushner: I care about rhythm and musicality. It is not so much a conscious decision, but I do look at how I compose a sentence or chapter in regards to rhythm. Other people have pointed out how vowel sounds of words I use are musical. I know when I read out loud -- I write for that purpose -- I consider the lines should sound good as well as look good. I don't think you always need to read out loud for musicality to appeal, though. With other people's work, if the language doesn't have a certain musicality then I am not comfortable reading, no matter what's in the book. SB: You've studied medieval and Renaissance ballads and used them as the basis for fiction in the past (such as your book Thomas the Rhymer). Do you think future fiction will ever mine modern song in the same way? EK: Not for me. I know other people who are very influenced by contemporary popular music. Joan Vinge often talks about popular songs running through her head that give her ideas in her writing. Even Charles De Lint will put a little discography at the end of a book. But specifically modern songs, for me, no. What appeals to me about the ballads is that they are part of a tradition. In my writing, themes of tradition and modernity play important roles. I'm always conscious of the fight between them, of what we gain and what we lose when we give up a tradition, and what we might find when we seek one out. Thomas the Rhymer is a modern novel (and I consider myself a modern novelist) that is centered around a vanished tradition that I still think has a lot to offer us. (Of course, it's hard to say in music what's "traditional" and what's "contemporary. With music and tradition, you have to consider: how far back do you go? It's a matter of function. Something can be only fifty years old and have become traditional -- look at singing around a campfire at summer camp!) But ballads are so alive. They offer us an eye into a world that people listened to as part of their daily lives. All art serves as a window onto the world that created and enjoyed it. SB: Your first adult novel, and arguably most well-known, Swordspoint: A Melodrama of Manners, has been called "an elegant, subversive work of interstitial fiction." I'm curious as to your response to this and your thoughts on interstitial fiction in general. EK: It doesn't get any better than that! [laughs] Elegant? Well, I have always wanted to write elegantly. Subversive? By all means. I'm proud to be interstitial. I think the book is subversive in genre. I did not write it to be a genre novel but rather in reaction to genre. What it does is take expectations and turn them on their heads. Some of this was unconscious, some deliberate. The beginning, the poetic opening, is a key to the entire novel. Here's this setting, and you are expecting a fairy tale, but you are not going to get one. This serves as an advance warning in expecting a genre, a coded message to the reader. Then there's the obvious relationship between the male leads, [and] a buddy relationship that goes against the canon by making them lovers. The fact that so many of the characters are amoral and make the read uncomfortable also is against the norm. SB: Tell me more about your thoughts on interstitial fiction. EK: People have to learn to live with it. Interstitial fiction's time has come. I was one of the people instrumental in coining the word. We needed a term to best describe what we do: writing and song and art between the recognized categories. Nowadays there is a real demand for such fiction. With Swordspoint, I intended it to be a mainstream novel, only set someplace else. Mainstream writing is allergic to anything not in the here and now or in an alternative past. I queried how to get past that, and interstitial may be the answer. Here is some more information on the Interstitial movement. SB: You wrote a story for Bending the Landscape: Fantasy, an award-winning series of queer speculative fiction. Do you think that such fiction is now more widely read? Does the sexual identity of characters influence who the reader is these days? EK: Certainly there has never before been a time when it's more accepted. There have been enormous changes in society since Swordspoint. The readers of The Fall of the Kings are more likely to be part of that. I carefully gave an advance copy to the staff at Sound & Spirit to see if anyone objected, and I was a bit surprised that no one was bothered. I also think that since Delia and I have written complex, realistic characters, the reader's own sexual preference is not an issue. SB: It has been fifteen years since Swordspoint and now readers can return to that world in The Fall of the Kings. How do you feel your writing has changed? How are the books different? EK: Well, I'm older and wiser. [laughs] I know more about the world and myself. My personality has changed, and I am less angry and scared. There is more confidence than when I wrote the first book. I now have this affinity for family and identity, a deeper perspective of how important they can be and how they are linked by time. The Fall of the Kings takes place sixty years after Swordspoint. Now I am in the same city dealing with the descendants or relatives of the characters. Twenty years [between the books] have given me a sense of the changes in people and society. That fascinates me. I could not have written Kings five years after Swordspoint. I needed the years to get a better sense of the world. Or maybe the reverse: as I have grown and changed so too has my city. I want to also mention and stress at this point that my partner Delia [Sherman] was just as responsible for writing Kings as I was. SB: The Fall of the Kings was originally published as a short story. Why the need to transform it into a novel? EK: We had all this great material we could not fit into the short story. Delia and I live together and we found ourselves making up stories about these characters to amuse each other. Roleplaying, or maybe gossip really, talking about these characters as if they were our friends. Eventually we said, "Hey we're writers, we should write these down." So we did just that and found what we wrote became longer and longer -- we weren't sure that it was working out. Then we heard about the Bending the Landscape anthology. We had to edit it down to a tight working story. But we cheered ourselves up while cutting/trimming by saying we could turn it into a novel. That was five or six years ago. SB: So what else is in the works for you? EK: Sitting on my shelf waits another Riverside book set fifteen years after Swordspoint (twenty-five years before "The Death of the Duke"). Katherine, the heroine of that book, is seen in Kings as a duchess. I don't want to leave my city and my people and find it hard to imagine giving them up. I'm also finalizing my Web site, ellenkushner.com. One of the things the site will have is a timeline of all the stories since so many people have requested one. I have also written things for performance: that is, for me to perform. First and foremost, The Golden Dreydl, originally created as a live stage performance with Shirim Klezmer Orchestra, is an annual holiday event in New York City, Boston, and now Philadelphia. It has just been released as a CD from Rykodisc. I got a grant to do another live show with music with a Jewish theme, though this one will be for adults and focusing on the Purim story: Esther: The Feast of Masks. I spent my summer workshopping it and am very excited. The show will be feminist and queer-positive and recorded for radio. I play six different characters including two teenage boys. SB: Speaking of teenagers, you no doubt have forgotten this, but a long time ago I summoned up the courage and called you at the radio show and asked for some advice on writing. You told me then, "Make sure your first novel is perfect." Do you still stand [by] such advice for beginning writers? EK: Did I say that? Wow. In my heart I still believe it, but I've seen enough of the world by now to know that such advice is not for everyone. I think it depends on what kind of writer you are, and on what kind of reputation you want to establish. EK: I think it is much better now than I did twenty years ago, when I was anxious that everyone would see the faults. Now I cannot remember what they were and I know people like it. I did not mean literally perfect. What I meant was, don't have the first thing you seriously want to show the public be something you don't believe is your best effort. SB: Thank you, Ellen, for back then and now. EK: You're welcome. It was fun. Steve Berman is the Newsletter Editor for Strange Horizons. Steve Berman has been a finalist for the Andre Norton Award ( Vintage: A Ghost Story ), as well as numerous times for the Golden Crown Literary Awards and Lambda Literary Awards. He has a new collection of queer and fantastical YA stories releasing in February, Red Caps . He resides in southern New Jersey.